The real crux of this problem, as I said, is the desperate lack of ideas. These shows are lacking in thought, concept and rigor. But of course, in much of the West, the myths about contemporary dance have been busted. And while it is unfair to attribute the busting of these myths entirely to Akram Khan, (of course, many before Khan have already proven both those things to be untrue) he certainly does it in style. 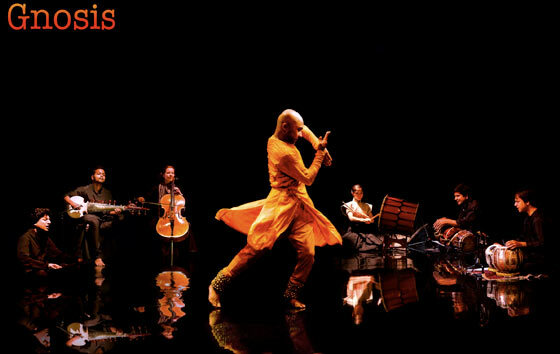 I recently had the rare privilege of watching Akram Khan dance, as I was at the showing of Gnosis, in Bangalore, India a few nights ago. Exactly ten years ago, in 2002, Khan performed his debut full-length performance, Kaash, a collaboration with Anish Kapoor and Nitin Sawhney, at the Edinburgh Festival. Since then, sometimes collaborating with other renowned dance-artists and musicians, sometimes with the gifted members his own Company, Khan has worked tirelessly and consistently to create some of the last decade’s best-known and most critically acclaimed works of contemporary dance. 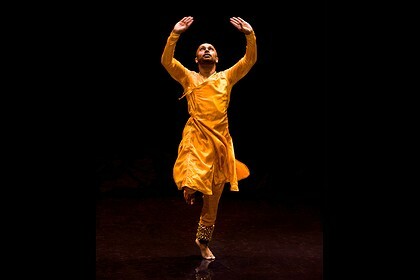 Today, he is no longer the ‘rising young star’ of the contemporary dance world – he is the authority, expert, veteran. At just 38, he is now recognized as one of the most important dancers and choreographers of his generation; an icon, a living treasure. But even more significant is that today, he is no longer known just by the contemporary dance world and those within its confines. His work is no longer just for the eyes of the audiences and critics that sit in elite theatres and opera houses. This year, he performed at the Opening Ceremony of the London 2012 Olympics. 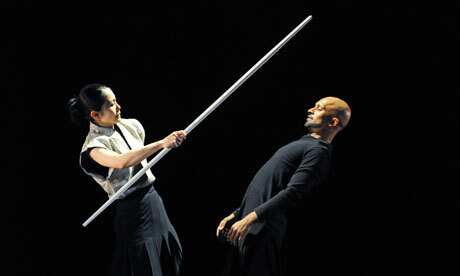 Akram Khan, contemporary dancer and choreographer, has been handed a rare opportunity: mainstream success. At London 2012, his work was viewed by thousands, perhaps millions, of viewers, positioned alongside the UK’s biggest pop-acts and chart-toppers: they were today’s TV audience, the reality-show audience, the So You Think You Can Dance audience. He who has performed on much more ‘prestigious’ stages, as far as a dancer is concerned, from Sadlers’ Wells to the Sydney Opera House, he who has been lauded with awards whose names are only ever recognized by some, has shown us that there are rare, marvelous moments in life when everyone – yes, everyone – takes a step back to recognize and appreciate real talent. Gnosis was evidence, as if we needed any, that if there is anyone in the world worthy of this attention right now, it is certainly him. The first half of the show is pure Kathak, and before long, the dancer and the dance have become one. It is not that Khan doesn’t play a little with the classical form itself – of course he does. But it is pure in the important ways, the ways in which classical dance should be pure; not just in form, but in soul. Khan’s body embraces the form; his lines (Kathak is all about the lines) are perfect, every movement executed with sharp precision. Even the tiniest gestures of the hands are carefully delivered, and always completed to exaction. His whole body moves, sometimes all the parts of it moving together, sometimes in opposing contrasts, to complex rhythmic patterns, always meeting in precise, breathless moments to create a pose, before it is quickly dismantled, the body regaining fluidity. His face is soft and real, his eyes and brow expressive, never once making it a mask of contrived, overly-trained expression. He delivers the soft tapping of the front-part of the foot as well as the decisive stamping of the entire foot equally convincingly; knowing exactly when to slow down and soften down, drawing us in, and when to explode with strength. It is a constant play between control and seeming abandon, a beautiful, astonishing combination of strength and delicateness; from the masculine stamping of the foot to the feminine dropping of the hand from the wrist. Ultimately, his Kathak is work and play; there are moments of focused devotion, and moments where his interactions with the musicians are much like a game. After he dances two pieces, he stops to chat to the audience. He relates to us, through a personal anecdote, his feelings about spirituality in classical dance – and this serves as a reminder that this man has made an important journey. Not just important for one as a dancer, but important for one as a human being. This Brit of Bangladeshi origin has come a long way to create this identity, and indeed, he is all about identity. His work itself dabbles with this question, not just identity in race and culture, but in dance itself: his journey from his Kathak roots to the striking contemporary dance he is now famous for. Then, Gnosis is the symbol of that journey: just as the echoing sound of bells around his ankles begins to fade from our minds, we are led into the contemporary-dance second-half of the show. Inspired by the tale of Duryodhana and Gandhari from the Mahabharatha, Gnosis also features Taiwanese dancer Fang Yi Sheu, former star of the Martha Graham Company. Together, they play out a lyrical, intense story of blindness and sight, seeking approval and perhaps never finding it, and ultimately of destruction. Gnosis seems almost designed to showcase Feng Yi Sheu, whose Grahamesque style of low, deep lunges is beautiful to watch. Khan’s brilliant choreography shines through, as the pair play with their bodies, and allow their bodies to play with them. But Gnosis is only momentarily playful; much of it is dark and focused. In a haunting climax, Fang Yi Sheu throws her body around as she is consumed and then destroyed, and Khan brings the piece to a frightening close, in a series of severe convulsions. By the time the light on him starts to dim, his body is just a blur. Because Khan’s body is rooted in Kathak, his technical precision is flawless: even when it is just his hands moving, in small wave-like movements, just in front of his own eyes, the movement is never pretentious because it is never lazy. He is always thorough and grounded. And though his contemporary style is influenced by his Kathak technique, he never makes the mistake of actually mixing the two: his contemporary dance work remains true to itself, as does his classical dance work. Gnosis speaks to you in typical Khan-style. If his classical dance is showy, a display of virtuoso, his contemporary dance is understated; in fact, it gradually stops being dance at all, and transcends dance as we know it to become movement. If his classical dance is pure, then his contemporary dance is transcendental. It is a magnificent exploration of space and the body within space. Yet again, he swings between control and abandon, releases and contractions, impacts and impulses. His choreography allows each movement to come easily yet carefully, and it is built seemingly organically by the bodies of the dancers themselves. Gnosis is the perfect example that Khan is not afraid to do things differently. Every element of the show and the space is carefully thought-out to create an atmosphere that allows the choreography to stand out. There was no fuss in the preamble: no lamps were lit, no speeches were made, no dignitaries acknowledged. The entire stage is black, with the stage-floor made black too, especially for this, and lighting works wonderfully well against this deep, black setting. The house-lights (the lights on in the audience) were never used; the audience is instead lit by two dim, amber lights on either side of the apron-stage. The musicians are sublime, and the music is too. There is just the right amount of experimentation and the right amount of playing by the book; though he dances Kathak to the unusual sounds of a Cajon – the Peruvian box – the rhythm patterns are classically Kathak. Khan is, in every single moment, in every single way, absolutely committed to his creation and to the experience of the viewer. From the moment you enter the theatre, you know that you are about to be treated to something unique, created by someone that really cares about every little detail. You know you are about to meet a perfectionist, a professional. And yet, he is never the star – or at least, that is how he would want it. In between the second and third Kathak pieces, the musicians are to play for us – without him dancing. However, through this, Khan, who has just danced two pieces back-to-back and has to dance another Kathak piece before he dances the 25 minute Gnosis, never leaves the stage. He stays on – watching, admiring, engaging with the music and the musicians and yet never upstaging them. He is not backstage, with his feet up, taking a small rest while his musicians buy him some time. They are not the interlude – they are part of the show, just like him. Not only do we have much to learn from him as a dancer, we have much to learn from him as an artist. He has no airs, there are no gimmicks; everything is astonishingly simple, and what remains with you even after you have left, is the power of the dancing itself. The question is, are our audiences ready for this? Several sections of Gnosis are performed in absolute silence – in these moments, sometimes stretching for as long as 6 minutes, it was clear that the audience were supremely uncomfortable, erupting in a chorus of coughs and shifting in their seats. Moreover, they responded to Gnosis, which was emotionally charged, in the same way that they responded to the Kathak, applauding every time he finished maneuvering complicated turns, applauding even as the convulsing climaxed, wishing to appreciate his mastery of the movement, rather than lose themselves in the horror of the moment. The answer is, we better be, because he is certainly here to stay, and he is pushing us a long a trajectory into the future of dance. Khan has a vision for this future. And his way of doing things is not just original and glorious; it is also friendly, humble and sincere. Thank you for this nice article. Which really reflects Akram´s Art as a dancer, artist and human being.